George Washington University defeated NLU Delhi to win the K.K. Luthra Memorial Moot Court Competition, 2011. 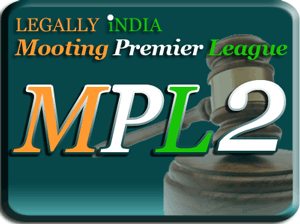 With a total of 41 points, NLU Delhi has now jumped to fourth position in the MPL 2 season standings. NLSIU Bangalore, semi-finalist at the competition, earned an important four points to move to third spot in the standings with a total of 43 points. Warwick University was the other semi-finalist. RGNUL Patiala added to its recent successes at NLIU-Juris Corp and Stetson North and became the third college to earn MPL points that moot as Vinayak Gupta bagged the best-speaker award. With a total of 36 points, RGNUL now stands at sixth position in the standings. George Washington University won the Best-memorandum award at this tier 4 moot. NLIU Bhopal currently leads in the MPL with 49 points, only three points ahead of Nalsar Hyderabad and six points ahead of NUJS Kolkata. The moot was organised by Senior Advocate Siddharth Luthra, the son of the late K. K. Luthra, in association with Campus Law Centre Delhi. Harman Walia from Campus Law Centre Delhi confirmed the results and said that the moot was organised on a large scale, seeing the participation of 46 teams including two foreign teams. We had advocates and judges from the High Court and the Supreme Court who adjudged the various rounds of the competition, he added. The moot problem was based on International Law and involved aspects related to genocide and jurisdiction. NLU Delhi has won the National Rounds of the Leiden-Sarin International Air Law moot, alongwith the Best Memorial Award. Seven Indian participated in this moot nad the top three teams shall be participating in the internationla rounds of this moot. Clearly, since this noot is not their in MPL once again NLU Delhi will miss out on due credit it deserves. It happened the last time when LawAsia moot was not included despite 4 Indians teams participating including NLS Bangalore. I dont want to sound pejorative but its high time a system is evolved to give us due credit. If Leader of the scoring board is so unfairly treated, its going to seriously damage the credibility of the not only the MPL of the entire website. If you are going tell me its too late to include it, and it unfair to the other teams. Please look back to how NLU Jodhpur was awarded points retroactively for some International MArtime Moot in which on 3 Indian teams partcipated. Honestly, missing out on points after WINNING TWO INTERNATIONAL MOOTS is the height of discrimination. Its only a matter of time before MPL looses its credibility.